Lower Priced Flag Banners. 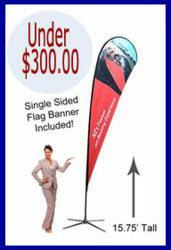 Anything Display announces new flag banners at lower prices and now with even faster turn times. Now's the time to buy. Flag Banners Lower Prices and Turn-around Time is Just a Few Days! Today Anything Display trade show supplier announced an increase in selection and a decrease in their pricing on the popular selling flag banners. John Webber Director of Sales at Anything Display says, "Since the demand in the marketplace for flag banners has exploded we've been busy trying to serve the increased demand and we've succeeded." The new "demand in the marketplace" for flag banners has Anything Display now offering flag banners at the best prices they've ever offered. An 11 Foot Flag Banner with Stand under $200.00 and the 15 Foot printed flag banner (shown right) and stand under $300.00. John concluded, "The increase demand has enabled us to slash prices and increase our turn-around time to just a few days. We hope to reach a larger audience online with this new value offering." To get the full spectrum of selections, the various sizes and shapes and the low costs for each visit their website.